 Uncle Wally’s easy new recipe for a Gluten-Free Fruit Tart will please everyone at your next spring gathering – whether or not they need to avoid gluten. 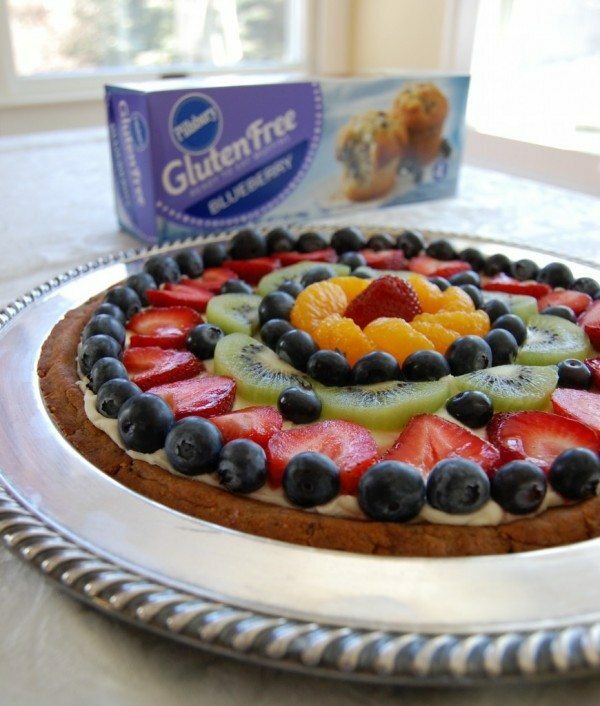 Our Gluten-Free Fruit Tart starts with a scrumptious cookie-like crust – so easy to make using our delicious new Pillsbury™ Gluten Free Ready to Eat Muffins – and is topped with an array of fresh, flavorful, naturally gluten-free fruits. What’s not to love? Gluten-Free Fruit Tart is simple, looks beautiful and, most importantly, is something everyone can enjoy. NOTE: Always read labels to make sure each recipe ingredient is gluten free. Products and ingredient sources can change. Blend 8 Pillsbury Gluten Free Muffins in a food processor (or break apart by hand in a mixing bowl) until the mixture resembles coarse meal. Add melted margarine and blend well, forming a thick dough. Spray cookie sheet with nonstick cooking spray. Place dough ball on cookie sheet and press evenly into a flat circle about 9 inches wide. Bake crust for 15-17 minutes, until firm and lightly browned. Let crust cool completely. Using a metal spatula to help, very gently slide crust from cookie sheet to serving platter (or the crust can be baked on an oven-safe serving plate, avoiding this step). Spread 1 cup gluten-free frosting over cooled crust, leaving about ½” unfrosted at the edge. Place a whole strawberry in the center of the crust, and begin laying fruits in concentric circles, working your way outward (see photo for an example) until you reach the edge of the frosting. Pillsbury Gluten Free Ready to Eat Muffins are the delicious result of a partnership between Pillsbury and Uncle Wally’s. They are individually wrapped for on-the-go convenience and are certified gluten free by the Gluten-Free Certification Organization. You can find Pillsbury Gluten Free Muffins in the all-natural freezer cases at Wegmans Food Markets, Ingles Markets, ShopRite Supermarkets and Giant Eagle Stores.